Two for the price of one? 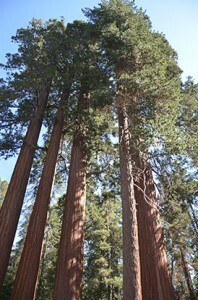 Visitors to Sequoia and Kings Canyon National Parks in California are able to see two major national parks in a single trip when they drive along Generals Highway, also known as Highways 198 and 180. We highlight the many spectacular places in these parks in this section of the Web site. We tell our readers about the world’s largest tree and a canyon deeper than the Grand Canyon. We tell you about the giant Sequoia trees, Tunnel Log, the General Sherman Tree, Grant Grove and the General Grant Tree, forested hiking trails, camping, the Giant Forest and the Giant Forest Museum. We will highlight drives and viewpoints, places such as the Kaweah River and activities such as hiking the parks’ trails and rock climbing. You will learn about wildlife in the parks and park history and culture. Tour Crescent Meadow with us. And learn about the tiny town of Three Rivers, Calif.
And we certainly hope you will enjoy our stories, photographs, and multimedia from our visit to Sequoia and Kings Canyon National Parks, to Three Rivers, to Grant Grove Village, and everything in between, as well as to the state of California. We hope we provide some helpful ideas for your own visit to the park.